Dallas-based TEGNA8 has decided to put a stop to the tenure of Sgt. Nick as Daybreak’s traffic anchor, sources tell unclebarky.com. 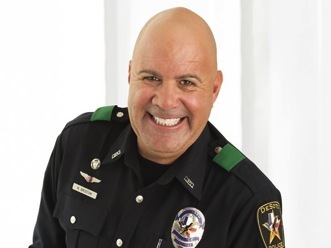 He’s been informed of the decision, but not of the date when he’ll go back to being a DeSoto police officer without a weekday early morning TV presence. It’s possible that will happen before the start of the February “sweeps” ratings period on Thursday, Feb. 2nd. Sgt. Nick (full name, Nick Bristow) was a corporal when unclebarky.com broke the news of his surprise hiring by news director Carolyn Mungo in August 2014. He had no previous TV experience before becoming D-FW’s first uniformed traffic anchor. Bristow has not returned an email asking for comment and Mungo does not communicate with unclebarky.com on personnel decisions -- or anything else for that matter. She does, however, later confirm them to TEGNA8’s official “content sharing” partner, Fort Worth’s Star-Telegram. Bristow had a steep learning curve and got better as he went along. But after nearly two-and-a-half years with Daybreak, he still wasn’t put in the same shot as the on-screen traffic maps. It gave his updates a somewhat disembodied look and feel compared to rival early morning traffic anchors on Fox4, NBC5 and CBS11. As recently posted, Daybreak co-anchor Alexa Conomos, who earlier had been the program’s traffic anchor, is leaving the station to spend more time with her three young children, explore other business opportunities and have a more normal existence. Conomos has not returned an email asking for comment, but later told the Star-Telegram that she plans to stay until her contract expires in June rather than leave when a replacement is hired. Daybreak, which currently ranks third in the early morning ratings, now faces the prospect of re-supplying half of its early morning team at hours when familiarity and viewer comfort levels are key. Should TEGNA8 decide to look in-house, it may not have to look any further than Marie Saavedra, who regularly has filled in on Daybreak with incumbent co-anchor Ron Corning. Saavedra currently is the station’s weekend evening news anchor. But Conomos told the Star-Telegram that she intends to help with the transition to a new Daybreak anchor, indicating for the time being at least that TEGNA8 plans to hire from outside. There would be no need to groom Saavedra. In terms of Bristow, there are two traffic anchors available who already are known to D-FW viewers. Tammy Dombeck is the most familiar of the two after traffic anchor tours at both NBC5 and CBS11, where she was let go for a younger blonde, Chelsey Davis, who since has left the station and been replaced by another young blonde (Madison Adams). Shane Allen was TEGNA8’s interim traffic anchor and spent five months with Daybreak before Bristow was hired to replace him. Fox4, an island of stability in comparison, has long been No. 1 in the early morning ratings with a longstanding team of news anchors Tim Ryan and Lauren Przybyl, meteorologist Evan Andrews and traffic anchor Chip Waggoner. Przybyl remains on the mend from a broken shoulder and wrist suffered in a fall at home.